Samuel Peralta Sosa, or “Sammy” Sosa as he is famously called, represented four MLB teams during a fantastic career spanning from 1989 to 2007. He played on the right field and is best known for his hard hitting, which made him a daunting adversary. Sosa’s professional career began with Texas Rangers in June 1989. During that season, the Rangers traded him to Chicago White Sox, where he would spend the next two years of his career. Just before the start of the 1992 season, Sammy found himself on the move again, and this time it was the Chicago Cubs, who had stepped up their interest in the budding superstar. 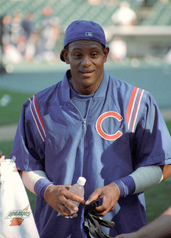 During his twelve-year stint at the Cubs, Sosa established himself as an American baseball figure (ironically because of his Dominican origins), and came to be known as one the greatest players in the sport’s history. The 1998 MLB season was one out of the fairytale for Sosa. It was during that season that he surpassed Roger Maris’ record of scoring 61 homers in a single season. Although Sammy scored 66 homers, his record was soon broken by Mark McGwire who hit 70 later that year. Sosa is the only player since 1948 to challenge the record for total bases in a season. His 416 bases is the closest anyone has come to Stan Musial’s 429. The year 1998 finished with a bang, as Sosa notched up several individual honors, including the Major League Player of the Year, National League MVP, and the Silver Slugger Award. He also featured in the All-Star Game (which he has done seven times), and shared the magazine Sports Illustrated’s “Sportsman of the Year” award with Mark McGwire. In the 1999 season, Sammy Sosa scored 63 homers, but McGwire’s 65 that year still saw Sosa trailing his “friendly adversary.” It was in the following seasons that Sosa finally managed to lead the charts for the highest number of homers with 50. The 2001 season was also one of Sosa’s better years as he scored 64 home runs and became the first ballplayer in history to score more than 60 home runs in three different seasons. 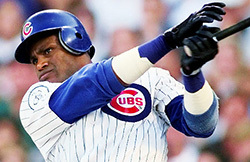 Sammy Sosa played the All-Star Game seven times during his career. He picked up the Silver Slugger title six times. He won the Roberto Clemente Award and MVP in 1998. The year 1999 saw him bag the Hank Aaron award. His career statistics make for remarkable reading, with a batting average of .273, RBI of 1667, 2408 hits, and 609 home runs. Sosa is one of the few legends to cross the 600 home run mark, and the first Dominican to do so in history. By the time Sosa entered the 2005 season with the Baltimore Orioles, he was far from his best, scoring just 14 homers. He did not receive a contract renewal at the end of that year and became a free agent, taking the year off and attending to other commitments. However, destiny had taken matters into her own hands when Sosa returned to the ballpark, this time as a player for his initial team – the Texas Rangers. To mark a remarkable ending to an amazing story, Sosa scored his 600th homer against the Chicago Cubs. And what is more fascinating is that he reached the milestone when he swung his bat against Jason Marquis – the new pitcher who had taken over Sosa’s #21 at the Cubs!